Raza Foundation in association with Civil Officers Institute arranged a dialogue among architect Vikram Lall, Bharatanatyam dancer Rama Vaidyanathan, and poet / film maker Udayan Vajpeyi, at Civil Officers Institute in New Delhi. Ashok Vajpeyi, the Trustee of Raza foundation, introduced the speakers and the topic. What is novelty in performing arts? Is it deviation of tradition? Questioning within tradition? Sometimes such questions are seldom understood. He further said that when Ravi Shankar introduced long aalap in sitar, it was understood as novelty and later on became tradition. In classical dance forms like Bharatanatyam, Kathak, Odissi and other forms, novelty is seen as retaining continuum. He quoted Mallikarjun Mansoor, the legendary vocalist, who said that it would always be great if the rasikas sat in front row and responded, but even if they were not there and even if the hall was empty, his job was to sing. Such artists are rare now. Even if the audience was less for the evening, Ashok Vajpeyi said the evening had to carry on with few members present. Vikram Lall besides being an architect has deep interest in classical music. He spoke briefly with prepared notes on what he meant by novelty. It is a catch word meaning movement; it expresses an experience, separates past and future. It gives a sense of newness. What is tacky, novelty transforms. It is a continuous process. It deals with change and innovations. In classical music with gharanas, various schools, we notice simultaneous changes. He spoke of speed culture, whereas Gurudev Rabindranath Tagore started painting when he was past 60! In novelty, there are disruptions and question of modernity and authorship also need to be examined. Rama Vaidyanathan observed that novelty in dance cannot come overnight. A long sadhana, period of hard work, when a dancer masters technique, under Guru shishya parampara, when the foundation is laid, and then she starts to create, push the boundaries, as an organic process. She mentioned state of evolution, and while observing nature, surroundings, waves of water, a state of constant inspirations is achieved. Beauty surrounding us, in paintings, sculptures, music, poems and philosophical thoughts helps a dancer to innovate, bring novelty. For her every new work she attempts is like giving birth to a baby and birth cannot be rushed. It takes its own time of nine months. So a dancer when creating novelty needs some time. For her the dance is a secular art, it crosses boundaries, transcends barrier of religion, and she gave a metaphor of Ardhanarishwara where dominant female principle works with male principle, in new creation. The process is like tight rope walking. Udayan Vajpeyi mentioned what architect Charles Correa used to say: "See beyond culture, inspired by it only will be limited." As Paul Klee said, the artist is like a tree. The tree absorbs a lot and then when flower is seen it has its own mark. It is like a cosmos within. He spoke of Western mode of learning and our traditions, also of manodharma, imagination. When learning Dhrupad music from film maker Mani Kaul, Kaul never corrected him and let him sing even when he followed Kaul's singing differently. Manodharma includes elaboration, which is core of performing arts. Sanskrit language is an excellent example. Recitation of Vedas, different shades of meaning resonate when speaking Sanskrit language, a unique language which offers unlimited imagination for a creative artist. Udayan gave example of Margi Madhu's recent performance of Dushasanavadham performed in Koodiyattam. He innovated when taking blood of Dushasana in one hand to anoint hair of Draupadi, as she had taken a wow that until she anoints her hair with Dushasana's blood she will not tie her hair. Having anointed her hair, in another palm Bhima took blood and brought it near her, but Draupadi showed revulsion at blood. This was never seen earlier by audience nor does the text say. But the manodharma by the dancer was a novelty and made the performance rich in expression. Within the tradition the dancer had managed to show novelty. When the audience was invited to ask questions Leela Venkataraman gave an example of her experience of seeing Ammanur Madhava Chakyar performing in Koodiyattam, Ravana playing with Himalaya Mountain and casting a spell on the audience. Past 80, with skeletal frame, he could hardly walk, and was made to sit on a stool. After concentrating with his eyes for quite some time, he suddenly got up and stood on the stool enacting Ravana's story and all were taken aback by the magnificent power of his performance. Such moments speak of the greatness of traditional art. And within traditional frame, they innovate. I recalled an incident of 1958 All India Dance seminar when Balasaraswati sang "Krishna nee begane baro" and displayed sanchari bhavas, showing child Krishna's pranks, and when he was eating earth, asked him to open the mouth and saw entire universe in his mouth, the ten incarnations and to the word Jagadoddharaka, a sequence from Mahabharata when Dushasana tried to disrobe Draupadi, and Krishna saves her from humiliation. Another incident I recalled was when Muruga, his own son teaches Om mantra to Lord Shiva, Bala performed with amazing sancharis. I could not follow what was happening as Bala went on showing removing of moon from Shiva's matted locks, serpents leaving Shiva were entwining the moon, the deer from the hand of Lord Shiva jumping on the moon, and therefore we call moon mriganka, Bala closing her eyes and so on. So after the performance I asked her to explain what she was performing as improvisation and she explained that even though Muruga was his own son, he was in the role of a teacher and before a teacher, Lord Shiva could not go with all his adornments. When she closed her eyes, she had suggested eclipse took place as serpents had covered the moon. What imagination. Manjari Sinha spoke of Kapila Venu, the daughter of G. Venu, a brilliant Koodiyattam exponent. From Kumarasambhavam she was enacting sequence of Parvati doing tapasya creating fire in all directions and sitting within it with the scorching sun above. Parvati's that state of tapasya was depicted with such imagination that one was spellbound! She also spoke of late vocalist Rashid Khan, past 104, but once he was seated on stage and sang we were all under the spell of his singing. Ashok Vajpeyi also recalled the grand old man of Koodtiyattam, Mani Madhava Chakyar past 90, at Bharat Bhavan in Bhopal. With his lustrous eyes when he performed abhinaya, directors like Habib Tanveer and Vijaya Mehta were taken aback as they had never seen such powerful abhinaya. And when Pt Birju Maharaj and Guru Kelucharan Mohapatra had a jugalbandi, Kelubabu with his bald head, two teeth blackened by eating paan and frail body performed abhinaya which we all remember. It was "Bihari ko bas kar lungi" song in which Kelubabu played Radha pressing legs of Birju Maharaj as Krishna. And when Rohini Bhate and Kalanidhi Narayanan performed abhinaya together, one in Kathak and other in Bharatanatyam, it still remains fresh in our mind. Such was the power of imagination they brought to their renderings. The dialogue and discussions were engaging and one looks forward to having similar dialogues. Ashok Vajpeyi suggested that we should have a small group of ten or fifteen rasikas exchanging such experiences. It's worth trying. The venue is not easily accessible and therefore, perhaps, the presence of rasikas was limited. The best venues are IIC and Habitat Centre. I am sure Ashok Vajpeyi would arrange similar dialogues/talks at those venues. Thank you, Raza Foundation, for such a stimulating evening. Jalpaiguri based young Pompi Paul, disciple of Paushali Mukherjee who studied under Guru Kelucharan Mohapatra, gave a delectable Odissi recital at India International Centre. 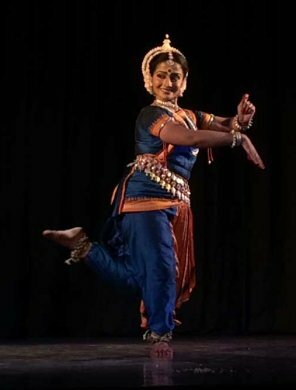 Like many young exponents from outstation, Pompi Paul is not known as a mainstream dancer though she has been performing for a long time in Kolkata and other nearby cities and also holds an annual Odissi dance festival Kolpadrum at Jalpaiguri. Pompi has an attractive stage presence, a mobile visage and an ability to register bhavas effortlessly. Her stances are correct though of late one does not see the chauka of Odissi executed as it was done earlier. But that did not detract from her presentation of Odissi in its all embracing characteristics. Ascribed to Kalidasa, the prayer "Manikyaveena mupalalayantim," the jewel studded veena being played by the goddess, choreographed by Kelubabu was performed with ease by Pompi with sculpturesque poses following Bhumi Pranam with trikhandi salutations. In a Pallavi in Anandabhairavi raga and eka tali, choreographed by Paushali Mukherjee, to music by Sacchidanand and mardala accompaniment by Paushali Mukherjee, Pompi's dance had a touch of leisurely execution suggestive of nayika putting on ornaments but dancing joyously. In Dashavatara choreographed by Kelubabu, Pompi displayed the beauty of Kelubabu's choreography for each incarnation with clearly defined hastas for each avatara, proceeding with ukutas and perfect postures. Each of Kelubabu's choreographies as danced by her found a felicitous expression. Kelubabu in choreographing Baladev Rath's champu "Lilanidhi he" has captured the subtle sense of overcoming the shyness of a nayika, when she found that Shyam had stolen her sari. She begs of him to return it to her. She promises him several things if he also decorates her with ornaments. The beauty of Kelubabu's imaginative choreography is revealed in addressing Shyam - who had vanquished Bakasura, who had danced on the hood of Kaliya. But these images come in the end fleetingly. To Guruji's choreographic touches, Pompi showed these images in a flash, reverting to the shyness. She begs of Shyam to put bindi on her forehead, to decorate her serpent like long plait, and looking into mirror watching Krishna‘s reflection, wonders what would people say if they were to watch their love play. So many allusions in this choreographic work are highlights of Guruji's approach. That Pompi evoked all this was highly enjoyable. Shiva Tandavam choreographed by Pushali Mukherjee had vigorous movements, describing Kishore chandrashekhara, Shiva adorned with crescent moon, who had turned Kamadeva to ashes, Rati Pati, and so on, to that Lord Parvatipati I bow. Rich in imageries it was danced with energy. The finale was another gem of Guruji's compositions, Durga Dhyan set to Kalyan, Malkauns, Sohini ragas set to ektali. The benign and demonic aspect of Durga with innumerable epithets in Sanskrit were visualized by Guruji in various iconic postures some drawn from sculptures, some from meditation, some from literary description, and as Mahishasura mardini, she with ten arms, Dashabhuja, wielding various weapons. It was danced with complete involvement. To see Pompi performing Guruji's choreographic works with such involvement was like revisiting those moments of his creative expression. Though there was a sparse audience, she put her heart into performing and it spoke to rasikas who gave her a standing ovation. Dr. Sunil Kothari is a dance historian, scholar, author and critic. He is honored with Padma Shri, Sangeet Natak Akademi award and Senior Critic Award from Dance Critics Association, NYC.